The vacuum cleaner market is filled with a variety of types, brands and technologies but when it comes to looking at vacuum cleaner types there are 3 main categories: upright, cylinder and cordless. This guide focuses on upright vacuum cleaners. 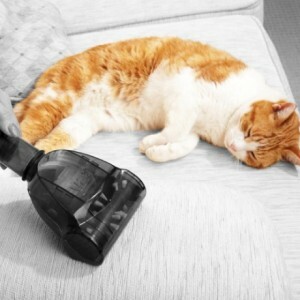 Why choose an upright vacuum cleaner? So our advice: choose an upright vacuum if you have a medium to large size house with many carpeted rooms. For smaller homes, a cylinder or cordless model will be sufficient. Is the model designed for pet hair? Many manufacturers offer “Pet” models in their ranges. The difference between these and standard models is the inclusion of a pet hair hand tool attachment (Dyson call this a “Turbine Tool” and Vax a “Turbo Tool”). Basically it looks like a standard hand tool but has a rotating brush bar to draw pet hair from carpet and upholstery. What is the dirt capacity? For larger houses or more regularly cleaning, then this is an important feature. The bin capacity of Dyson and Vax models varies between 1 and 3 litres. Larger bin capacities will mean less frequent emptying. How much does it weigh? Upright vacuum cleaners typically weigh between 4 and 8kg, so avoid heavier models if pushing or carrying up stairs might be difficult. How long is the power cord? Surprisingly power cord lengths vary not only between brands but also manufacturer’s own models. The longest cords are around 10 metres in length, the shortest 6 metres. Longer cords are great for avoiding changing power sockets when cleaning. How far can the attachments reach? Most upright vacuums come with hose attachments and again these are in different lengths. Unfortunately, Dyson and Vax quote different measurements (Dyson use “reach” and Vax a more standard “hose length”). This makes comparison between brands more difficult but comparing between a manufacturer’s models is still possible. As of 1st September 2014, all corded upright and cylinder vacuum cleaners are required to have an Eco label (similar to other household electrical appliances) that show their cleaning and energy efficiency along with a number of other ratings. All corded vacuum cleaners are allocated an “A” (best) to “G” (worse) score for each rating. We have not included the new energy ratings in our comparison table as most of the models we considered had an A or B score for carpet and energy efficiency. Dyson and Vax are two very popular brands when it comes to upright vacuum cleaners. They both do exactly the same job but the Dyson models will cost you at least £200, whereas a Vax machine can be yours for less than £100. Dyson was the first manufacturer to introduce the “cyclonic” bagless upright vacuum cleaner in the early nineties. The main benefit of these machines was they never lost suction like traditional vacuums did as their dust bags became full. Since then however many manufacturers have launched similar vacuums to the Dyson, while the Dyson range has been constantly updated and improved. When it comes to design, the Dyson machines still look very good but when considering features and specifications though there is little to compare the Dyson and Vax machines. Not only is the Vax Air Reach (model Reach U90-MA-Re) the most popular Vax upright vacuum, but it’s also one of the bestsellers on Amazon.co.uk, and it’s not hard to see why. Although the Air Reach has an RRP of £280, it can often be found for less. The Reach is part of Vax’s Air range and offers multi-cyclonic technology to provide excellent cleaning performance. The Reach can be used on both carpets and hard floors and achieves an “A” pickup rating for both these floor surfaces. The Vax Air Reach is also around 1kg lighter than similar Dyson models while still having a comparable 1.5 litre dust bin capacity. This particular Reach model also comes with an additional 2.3m hose, making stair vacuuming incredibly easy. The Vax Air Reach is also supplied with a “Turbo Tool” hand accessory that is designed to make picking up hairs easier. If you can purchase this upright vacuum cleaner on offer it makes a great buy. 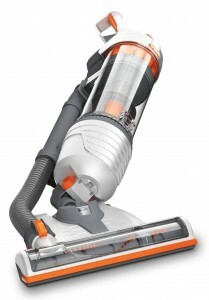 The most popular Dyson upright vacuum cleaner has an RRP of £350, so a lot more expensive than the Vax Air Reach. Although the Vax and Dyson are similar in many respects the Dyson has some unique features that go some way to justifying the difference in price. The first is the swivel ball technology which allows you to move the Dyson DC40 easily around the room whilst also making it easy to get into tight spaces and under tables or beds. The DC40 also features a self-adjusting head that adjusts the height depending on the surface, so you can vacuum between carpet and hard floor surfaces without stopping. Another useful feature on this Dyson upright vacuum is the hand tool and hose that pulls out of the handle without having to fix any attachment to the hose; and it can reach up to 12 metres from the vacuum cleaner! Is it worth the extra money though? Well, the price can be partially justified by the performance and unique features but the Vax Air Reach is such good value with an RRP nearly £100 cheaper, and therefore the Vax gets our vote.